Based on reviews from 7 experts and 30 users. Learn how our rankings work or see our guide to New Balance Furon football boots. Updated Apr 2019. New Balance has been in the sports footwear industry since the 1900s. They started creating football boots way back in 1984, with Manchester United and England player Bryan Robson as their poster boy. Their first football boot will remind you of the timeless Adidas Copa football boot or a classic Nike Tiempo Legend because of its leather upper and cross stitching pattern in the forefoot. New Balance re-entered the football scene when they released their 2015 football boot lineup. When they took over the kit deals of their subsidiary, they rebranded the Warrior Football footwear and apparel campaigns as New Balance. Using the ‘Make Chances, Take Chances’ promotional campaign, the Boston-based sports apparel company launched the New Balance Visaro and New Balance Furon football boots for wingers and strikers. The distances run by football players in one 90-minute game far exceeds the distances of any other sport. With the company’s decades of experience and expert knowledge in making high-quality running shoes and comfortable sneakers, New Balance football boots clearly have an edge against Nike football boots, Adidas football boots, and Puma football boots. The first line of New Balance Furon football boots was first released in the summer of 2015 for attack-minded players who ‘Take Chances’ or the so-called ‘Finishers’. The company made these lightweight football boots to meet the performance demands of modern-day players and boost their skills. They are designed to provide maximum maneuverability and explosive acceleration for agile playmakers. The New Balance Furon football boot colorway was first released in the Royal Blue Colorway. An interesting feature of this football boot is the ‘honeycomb’ structure in the upper, similar to that of the Nike Hypervenom Phantom. This structure offers better ball control both in wet and dry conditions. The upper material also provides an excellent energy return. The fit is maximized by the Fantom Fit cage which helps keep the foot locked in place. Thus, allowing the player to change direction at high velocity. The lightweight New Balance Furon football boot has a ‘burrito-style’ tongue and an asymmetrical lacing system; both create a larger and cleaner striking surface. The stiffened soleplate and ultra-directional studs increase straight-line speed and velocity. It also has an external heel counter and a mesh heel area that enhance stability. A spine running through the middle of the outsole, similar to what you can find on a Puma evoPOWER football boot, keeps the soleplate stable. Released in the same year as the Adidas X line, it can be said that the New Balance Furon football boots are similar to Adidas X football boots when it comes to looks and function. However, there are some key differences between these two 2015 releases. The New Balance Furon football boot is more affordable than the high-end Adidas X football boots and even the second-tier Nike Mercurial football boots and Nike Magista football boots. It also has a wider fit compared to its Adidas football boot counterparts. The second edition of the New Balance Furon football boot was released on May 2016, a year after the original version was launched. 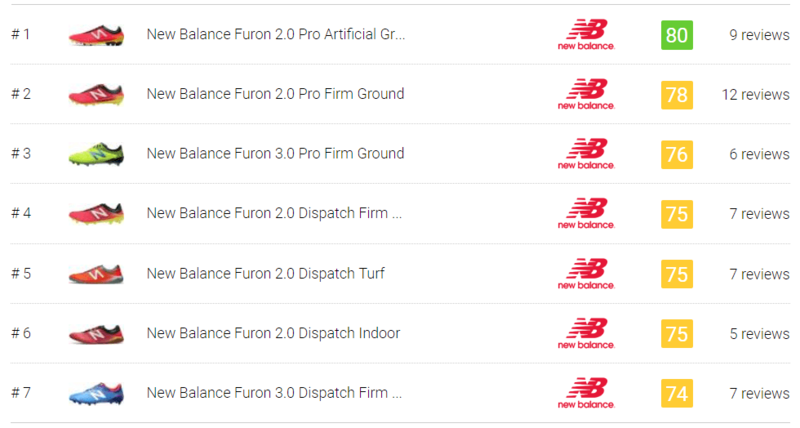 The company took into consideration some feedback from the previous version and made a few notable improvements with the New Balance Furon 2.0 Pro. These include the new material for the upper, as well as the heel cut and lacing system. An important update on the 2016 New Balance Furon football boot is found on the upper. It is made up of three layers of mesh material which is softer and more pliable than its predecessor. This improvement was well-received by most expert reviewers. The off-centered ‘burrito-style’ tongue was discontinued and replaced by the newly released lacing system. By doing so, the player can loosen and adjust the tightness of the New Balance Furon football boot in the forefoot area. Another key addition to the 2016 New Balance Furon football boot is the Galaxy Sprint inspired ankle collar. New Balance took inspiration from the running spikes that track runners usually wear. There is an extra padding below the ankle and a thin material lining against the ankle. Thus, ensuring that the ankle is locked in place while still allowing it to move more naturally. The rest of the features are the same as the original New Balance Furon football boot, including the REVlite technology and the FantomFit cage. The soleplate maintains its futuristic design with the Ultra-Directional studs that offers excellent traction and acceleration on firm grounds (FG). The relatively young New Balance Furon 2.0 was prematurely discontinued to make way for the most recent New Balance Furon football boot, the New Balance Furon 3.0. The company took the time to focus on improving the silo in order to become one of the most competitive speed boots on the market. On July 2017, two versions of the New Balance Furon football boots were launched, namely the New Balance Furon 3.0 Pro and the New Balance Furon 3.0 Leather. Receiving raves from many expert reviewers, the third-generation New Balance Furon football boot can potentially become a real game changer. Launched in the Military Dark Triumph/Alpha Pink colorway, the 2017 New Balance Furon football boot maintains the modern, stylish design of the silo. Because it is designed with agility and accuracy in mind, the upper is made of a thin, mesh-based material to keep it as lightweight as possible. The synthetic New Balance Furon football boot retains some useful technologies from the previous generation, including the REVlite foam insert and the FantomFit overlay. However, New Balance also added new technologies such as the lightweight hybrid-mesh upper with the Zonal support frame. This is the first ever New Balance Furon football boot that uses genuine kangaroo leather. It has the same silhouette, tongue construction, and soleplate as the synthetic New Balance Furon football boot. With the N logo on the instep and outstep of this football boot, the leather New Balance Furon football boot is not only a well-performing football boot but a trendy one as well. Revlite - This innovative midsole technology is made of a special foam compound that acts as a responsive cushioning system. It is durable and 30% lighter than a regular foam midsole. Thus, creating a smooth ride without compromising the New Balance Furon football boot’s underfoot support and stability. Fantom Fit - It is a fused support system that is skeletally engineered to provide lightweight support. With the FantomFit cage, the New Balance Furon football boot wraps around the foot naturally. Which type of player can benefit most from using the New Balance Furon football boots? The New Balance Furon football boots are best for players whose main strength is speed. These lightweight football boots can enhance a destructive playmaker’s goal-scoring skills. Which football boot from famous brands can you compare a New Balance Furon football boot with? Because it is a speed boot, the New Balance Furon football boot stands side by side the likes of Adidas X football boots as well as Nike Mercurial football boots. When it comes to protection, the lightweight New Balance Furon 2.0 Pro can be compared with the Puma King SL. Who are among the famous football players who have worn the New Balance Furon football boot? Some of the famous football athletes who have worn a pair or two of the New Balance Furon football boots include Adnan Januzaj, Alvaro Negredo, Jesus Navas, Aaron Ramsey, Samir Nasri, Tim Cahill, and Vincent Kompany. What makes the New Balance Furon football boot unique from the other speed boots on the market? In spite of being a lightweight speed boot, the third-gen New Balance Furon football boot provides a reasonable level of protection against metatarsal injuries caused by the opponents’ stomps and smashes.